In addition to producing seven U.S. Presidents, astronauts John Glenn and Neil Armstrong, a host of authors, actors and other celebrities, Ohio plays an important role in the 50th anniversary of our Nation’s Interstate. Harvey Firestone, founder of the Firestone Tire and Rubber Company, was born in Columbiana, Ohio, in 1868. As a young adult, he worked for the Columbus Buggy Company. In 1890, he started his own company to make rubber tires for carriages. And in1904 he joined Henry Ford to make rubber tires for the newly invented automobile. The two became family when Henry’s grandson married Harvey’s granddaughter. 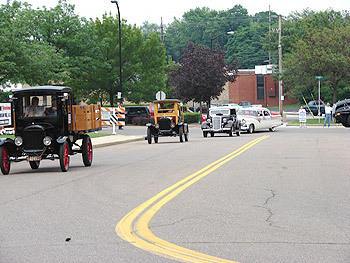 Vintage cars represent the 1919 Convoy led by Lt.Col. Dwight D. Eisenhower. In 1919, Lieutenant Colonel Dwight D. Eisenhower led that famous military convoy across America as a test to see how well they could perform if the U.S. was attacked. During the 3,250-mile trip from Washington, D.C. to San Francisco, the average speed was an unbelievable six miles per hour with drivers having to stop frequently to remove obstacles. Early automobiles were good only on roadways so a tractor was included in the convoy to pull cars out of mud on such unfinished roads as the Lincoln Highway. The convoy stopped at Firestone’s farm in Columbiana for a fried chicken dinner. Afterward, Harvey Firestone lent two of his trucks for the remainder of the trip. The pneumatic tires on Harvey’s trucks wore far better than the solid rubber tires on the convoy’s military vehicles-and the rest is history. In June 2006, a national convoy retraced the route of the 1919 First Transcontinental Motor Train in reverse. On June 25, the anniversary convoy stopped in Akron, Ohio, at the Bridgestone Firestone North American Tire Company. Patrick Bauer, Ohio Division Assistant Division Administrator, attended this 50th Anniversary of the Eisenhower Interstate System Celebration with personnel from the State of Ohio and the Ohio Department of Transportation. 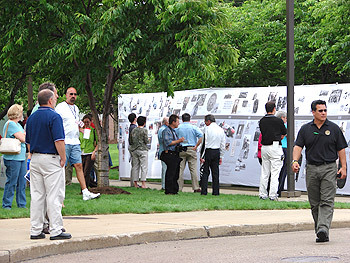 Visitors enjoy historic display on the grounds of the Bridgestone Firestone North American Tire Company. Photographs contributed by Patrick Bauer.